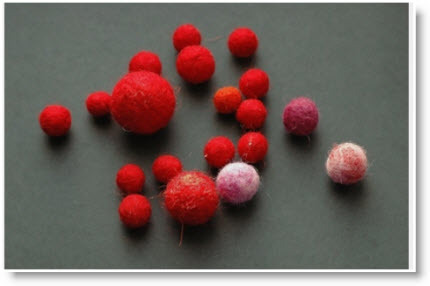 If you have never made “felted balls” here is a refresher tutorial on making felt balls and darling “Pine Cone Christmas Ornaments” by Birgit of “By Number 19” certainly has a way with felt. You can paint the Christmas tree or make an ‘organic’ version without paint. The green version is painted with white paint and immediately after sprinkled with silver glimmer. Glue the small felted beads/bobbles under the petals. 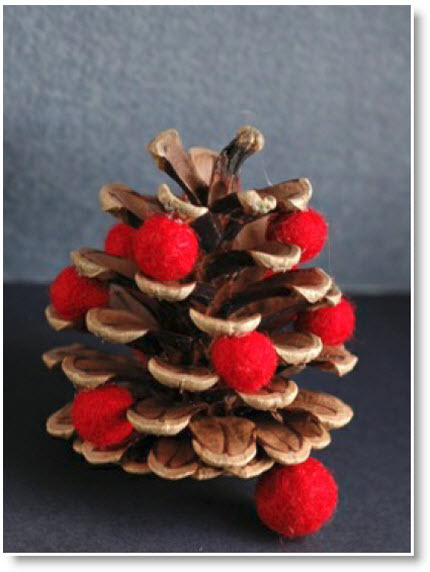 She has a downloadable PDF file with instructions for four “Pine Cone Christmas Ornaments”! Thanks again Birgit for inspiring us.